I have always written in journals. It was where my love for writing and expression began, way back when I was a young teen. I started writing my thoughts when they were a jumbled mess of hyper-emotions and irrational fears, idealistic dreams and unrealistic fantasies. I love reading back on those first few books, and all of them since then. 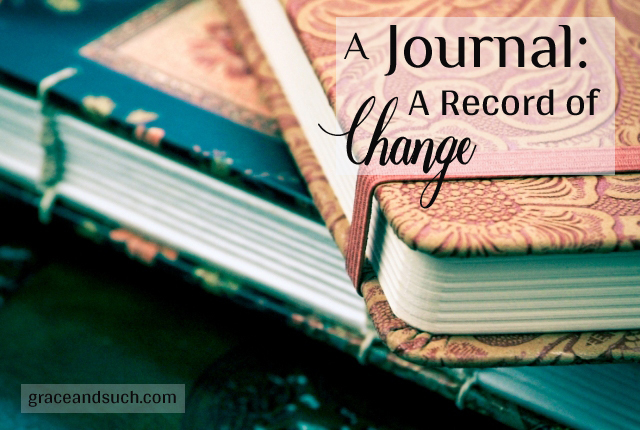 Journaling remained a habit throughout my teenage, college and young married years. I recorded my college years, my boyfriend years, and my “big dreams” years. I have journaled my pregnancies, my first months of babies and my first thoughts about being a mother. I have recorded marriage struggles, relationship struggles, worries, prayers and victories. My journal has become for me a record that spans years, and I have boxes of books to show for it. My favorite part of journaling is looking back and seeing the changes in myself. When I look back over past journal books, I see an entirely different person than I am right now. I see a young woman struggling for identity. I see a young mother looking for steady footing in a new world. I see a friend, sister, daughter, and wife learning how to love those around her. I see my relationship with God evolve and myself learning new lessons over the years, all while glancing back for a few minutes. With journaling we can capture a picture of ourselves and God’s work in our lives, as we record our daily thoughts and feelings over a span of time. When looking back, we can see a progression of growth, change and God’s activity in our lives that we may not see otherwise. We can see answered prayers, fulfilled dreams, and God’s plans stretched out over the years. [pullquote width=”300″ float=”right”]Journaling is a tool for reflecting God’s presence, guidance and nurture in daily comings and goings. [/pullquote]It can be done every day, or just ever so often. It can be something you do as a list, or in a narrative form. It can use big words, or simple ones. You can fill a half-page, or several pages. You can journal your daily thoughts, or just during those times when God has you in transition. It can be in a pretty book or on a computer. You can write to yourself, or to God. We can track changes in our hearts and vision by taking the time to record thoughts and feelings on a regular basis. This gives us a chance to see how God acts in our lives over time, and to see the thread of his work throughout the days and years of our lives. It allows us to pull back months and years, to see where he was going with us. Choose a pretty book. A blank book that is pleasing to look at holds so much potential. Find a book that reflects you well, and its beauty invites you share your thoughts there. Write a little when you can fit it, and a lot when you are feeling a lot. Don’t feel pressure to write any specific amount, just write it down. Always date your entries. This is a must. I like to write a little mini-intro in each of my new journals, because I like to be able to open an old journal and see where in my life I was at the time. Read back over old journals from time to time. You will smile at some memories, and remember how God took you through the valley with remembrance for others. Include scripture and quotes. Sometimes my only words for the day are God’s words. There are times when the best words to reflect my heart have already been written. Journaling can be overwhelming for someone who doesn’t love writing. It can feel daunting to sit down and give words to thoughts. It may take some practice, but will most certainly bless you. Courtney is a wife and homeschooling mother to three boys. She has published her Bible study, "Everything You Need", and has two more on the way. Thanks for this insight into journaling, Courtney. I began journaling in earnest about a year and a half ago, and it really is nice to have a record of my prayer requests, my struggles, & where/how God faithfully meets my needs every single time. Thanks Gretchen! May God continue to bless that time you spend writing out those blessed things! I am a fair weather journaler. Or a stormy weather journaler, as it were. My journaling is spotty, but I love to go back over my prayer journals and see how God was working in my life at that time. Thanks for reminding me what a blessing journaling is. From one journaler to another, GREAT JOB! I began journaling when I was 13 and because my life took many twists and turns, I have none of those teenage thoughts to reflect back on. However, I have about 10-15 to cover the last 12 years of my life and although I should, I’m afraid to go back and see how much of a mess I was then vs. the growth made. Based on what you’ve stated, I think I’ll brave the mental and emotional elements and venture back 12 years ago to see just how much I’ve grown and the wisdom gained by life changing me.